Most of the K'NEX sets below are designed for use in school and in other educational settings, although home users of K'NEX may also find them of interest. These sets have been carefully selected so as to offer a combination of enjoyment, versatility and value for money. They are available for shipping worldwide. Click on any image to display full details for that set. Please email us if you would like to order more of any set than we currently have in stock. Supports 10-20 students working in groups of 2-4. Ideal for STEM explorations. Build two large models simultaneously. Investigate all aspects of velocity, kinetic and potential energy, work, etc. Full colour instruction book plus extra designs on CDROM. 75-page teachers guide containing 9 physics lesson plans. Supports 8 students. A superb general-purpose motorised classic K'NEX set, for K'NEX enthusiasts aged 5 to 95! Equally suitable for use at home, or in schools and other educational settings. ♦ A 218-page instruction book and also a 104 -page instruction book, with printed full-colour instructions to build 80 models, many of them motorised. A K'NEX curriculum set that helps pupils to develop maths skills through active, constructive learning. Builds 28 models from colour transparency and black line master activity cards. The perfect larger K'NEX set for your Makerspace! The K'NEX Maker kit Wheels includes three different types of motor - a spring motor, a fly-wheel motor and a battery-powered motor. Wind-powered, hand-powered and rubber-band powered vehicles can also be created with the set - that's 6 unique power sources, to intrigue and inspire your budding Makers. Instructions for 11 different types of vehicles are included, and there are enough parts to build 4 of some vehicles at the same time - meaning up to 4 Makers can work from the same kit. Also increasingly popular as an educational K'NEX set for the home. The set comes in a robust plastic tray with dividers, allowing sorting of parts into compartments, for ease of selection. Robust storage box containing 6 x K'NEX Infinite Journey coaster sets. Ideal multi-pack for use in summer schools, playschemes, whole-class activities in school, and other educational settings. Each of the six sets comprises the rods, connectors, coaster track, coaster car, battery-free slingshot launcher and instruction book to build a working roller coaster approximately 64cm (2 feet) in height. 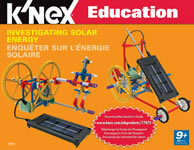 Go green and bring science to life with the K'NEX Investigating Solar Energy set. Learn how to convert the energy of the sun into electricity, to power working K'NEX models. Includes 128 K'NEX parts, including a solar panel and motor, capacitor and 5 gear wheels. Comprehensive instruction book and teacher's guide. Packaged in a strong storage tub with snap-on lid. The K'NEX Vehicles building set includes two K'NEX motors. The set allows 1-2 children to build 7 vehicle models with different power sources, including a spring motor, rubber band power, wind power and push-power. The fascinating K'NEX Gears building set allows 1-2 children to build 3 geared models: a Crank Fan, a Car Window and an Egg Beater.